He who desires but acts not, breeds pestilence. 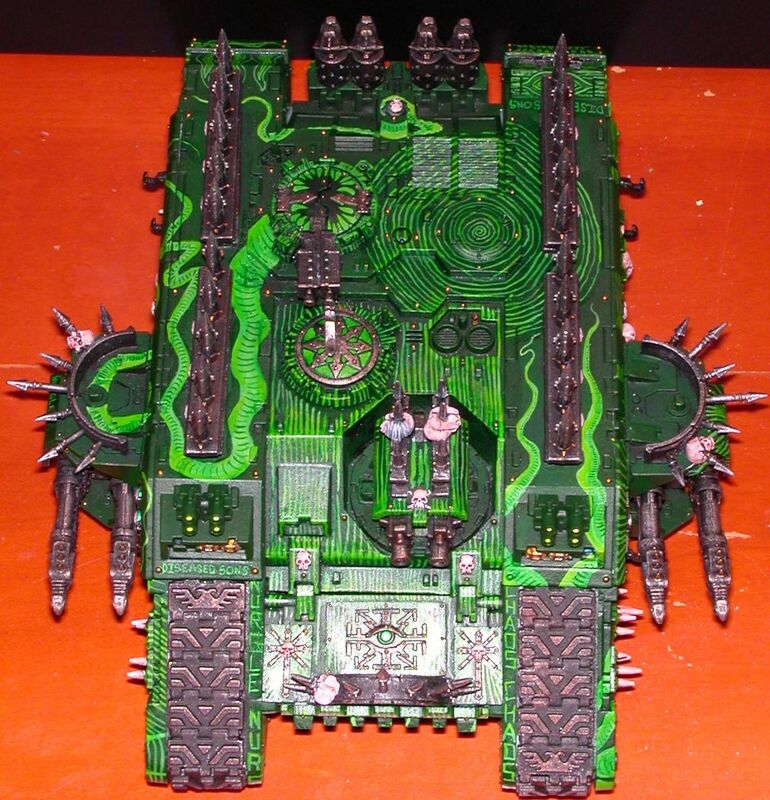 It's big, it's green, it's a tank without an interesting name. Yes it took a long time to paint. No I don't advise doing this yourself. 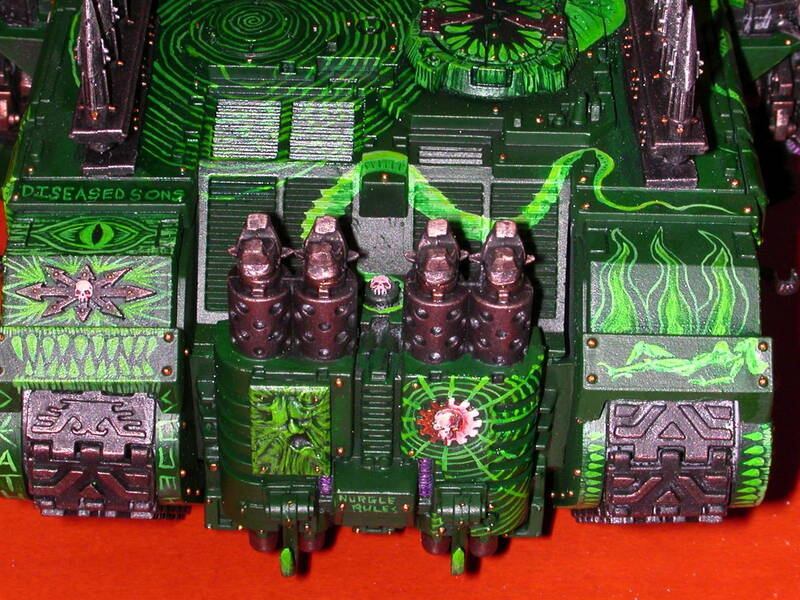 Yes it is painted as insanely detailed on the left side, the right side, and the back too. However I figured obnoxiously large pictures were too much for the dial up users, so click only if you want to waste your bandwidth and mine. It isn't my best work, but then the people at coolminiornot don't seem to care for my painting, neither did the Grand Tournament Judges in Calgary. They didn't even look at my tanks, or my characters, just one or two random models in the far corner, which I imagine had pretty old paint jobs. My final score was lower then a guy who painted his army in three days. But I'm not bitter, I'll show them Calgary guys what to do with a paintbrush. ;-) I'd like to see someone paint this tank in three days. When TWAIN and the rest of my army make their Vancouver GT debut, the judges better give my models more then a cursory glance, I put way too much detail into them to appreciate them at a casual glance. As for TWAIN's in game performance, all I know is I couldn't damage the Landraiders I ran into at GT Calgary 2002 and I decided if you can't beat em, join em. 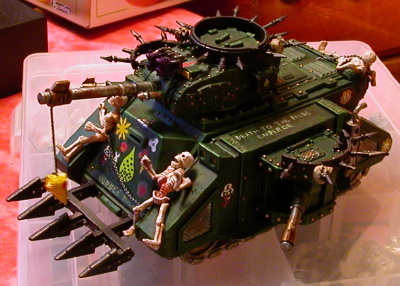 The second vehicle err tank I painted for this army (chronologically). At the time I built it a certain Midwest "Jeff" was spewing forth great heaps of prose on the list. A rivalry of sorts developed between his fictitious army general and my fictitious army general. Many words were written. Jeff probably thinks he won all such debates but I think I summed up my opinion quite well with this model. The Imperial Fists were GW's chapter of the moment when 3rd edition was first released. I was sick of them too, so I took an original beige beaky head and hung it from the barrel. I also painted my version of their chapter badge on one side panel. This tank has two lascannons and an autocannon. And often when I played these were my only heavy weapons. I usually just parked the tank and shot. I also screened my only heavy weapons with a squad of Plague Marines. With the arrival of 4th Edition this is a suboptimal armament in my opinion. However it is still a perfectly good tank. 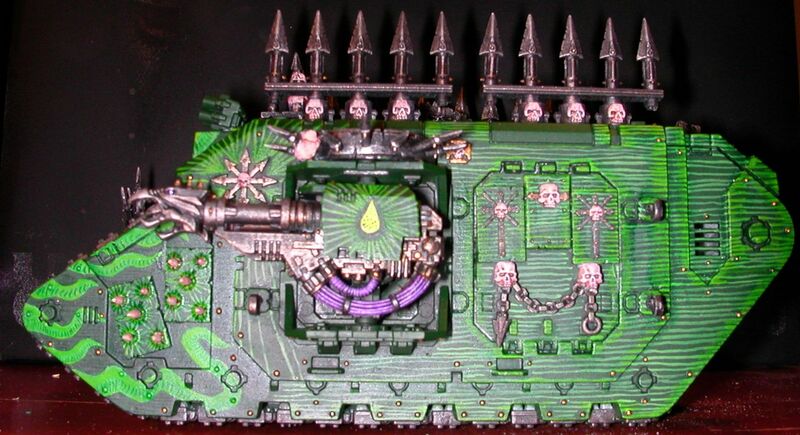 The paint job was a bit dated and the conversion lacked a bit compared to what is usually done now a days so I rehighlight it, added more spikes and skulls, some battle damage and graffiti and painted all the brass bolts and now look forward to trying it out under the new rules. 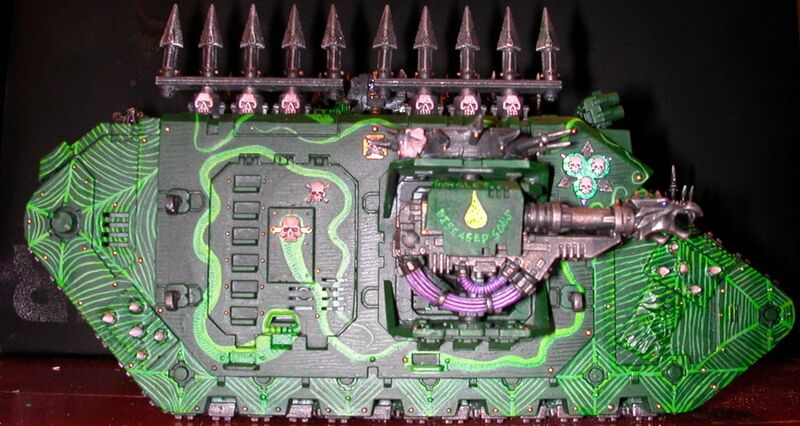 My next predator will have twin linked lascannons and possibly heavy bolter sponsons. Unfortunately the quick snap I took on my mom's table is a bit dark. This is not the most famous phrase I've ever scrawled on a tank. Note in this extreme close up you can see where I had to touch up while writing and even tiny white specks in the chapter badge. My new camera is pretty slick cause that whole rhino rear panel can't be more then an inch high. Words and Images © Andrew "Muskie" McKay.